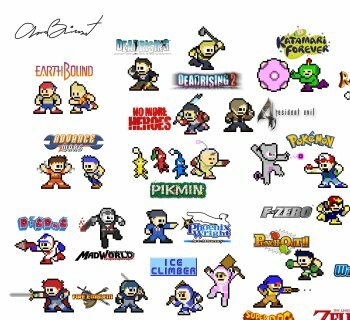 An enterprising artist re-imagined more than 200 classic and modern videogame characters as they might appear in Mega Man. Chris Bringhurst works at a call center and usually has long stretches of time with not much to do. One day, he started to imagine what Master Chief from Halo would like in the Mega Man universe. So he tinkered over the next two days when he wasn't fielding calls and ended up with what he thought was a pretty good image. "People liked it and asked me to do others, so I tinkered with Mortal Kombat a little, then Nathan Drake from Uncharted, and I realized that there were literally hundreds of characters in the video game universe who might really work with that retro look that we all love," Bringhurst said. "Two months later, here I am." About a month, Bringhurst posted an image with about a hundred of his Mega Man adaptations on Reddit. He was flooded with requests for even more. "This second batch I did was originally started to respond to the dozens of requests I'd gotten after that first hundred I'd done," Bringhurst said. Check out the full image here. Be warned, the file is pretty huge but once you click on it, you will be sucked in to looking at it all. The inspiration to create these images may have come from his father. "I was fortunate enough to have a dad who was absolutely obsessed with video games, and from day one he had me playing games," Bringhurst said and that's probably why he has an appreciation for the classic series. "Mega Man, Mario, Sonic the Hedgehog - I feel like I have an almost eerily intimate relationship with those franchises."